Explore the tools below. Then, for more ideas and resources to share with your student visit the Build Your Practice section. We have free, downloadable workbooks to accompany our textbooks. These workbooks are in PDF format and include chapter summaries, the exercises from the book (plus some additional ones), major checklists, and a glossary. If you already have access to the Teacher’s Library, the Workbooks are also available there. This guide takes your students through the essential steps to prepare for success by the time they graduate. We’ve divided the school term into six segments with a checklist of goals, activities, and skills to accomplish by the time they are done with that segment of their education. The guide also includes an “After Graduation Checklist” to complete while students wait for their licenses. If you already have access to the Teacher’s Library, this guide is also available there. 2019-02 Stop Doing This Discussion Technique! 2018-01 Do Your Use Powerpoint? 2016-11 Have a struggling student? Send them an invitation! 2013-05 Schwartz's "One Minute Paper"
2009-09 For What Kinds of Communication is Email Good? We have created a free brochure for you to give to your graduates as they prepare to embark on their careers. 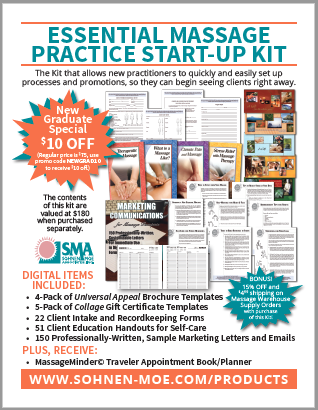 This brochure includes an After Graduation Checklist, a discount code for our Essential Massage Practice Start-Up Kit, as well as information on other resources from SMA that new practitioners can use to build their practices. Contact us to request these free brochures for your next graduating class. You can also directly print this poster (displaying our discount code) and hang it in your student lounge, bookstore, or any other appropriate area for students and graduates. The Essential Massage Practice Start-Up Kit makes a great graduation gift. Please contact us if you are interested in buying them in bulk for your students. We do offer volume discounts for schools. As the only online charting system designed just for schools, Hands Heal EHR meets the unique needs for teaching charting and managing student clinics. Teachers, students, and administrators can log in from their computer, tablet, or smartphone to the web-based system. Instructional prompts help reinforce charting lessons for students. Teachers can communicate securely with students, and clients can even log in and give feedback. Curriculum support is available at no extra charge from founder and charting expert, Diana L. Thompson. One monthly fee covers unlimited faculty and students. To learn more, visit handshealehr.com.